For my endless love for beer and sausage I have scouted through this years Oktoberfest celebrations and picked the ones I thought sounded most promising - and by promising I mean a good selection of beer, and general madness - after all Oktober Fest isn't about fine dining and fanciness - Its about Beer, Brat and Boisterousness! The beer that seems to be making the rounds in all/most restaurants and bars that are participating seems to be WEIHENSTEPHAN - "The Oldest Brewery in the World" from Munich, Germany. TLR - If anyone has it right its them. They are not just another restaurant running with the latest money making fad - they've got woozey over good boozey and they are sharing! Besides an already existing amazing range of beers - their special Oktober Fest beer is WEIHENSTEPHAN. I recently paid Rs.500 for a Corona and HKV's newest nightspot Verve - for a Corona - why Im still trying to understand. So finally some justice. 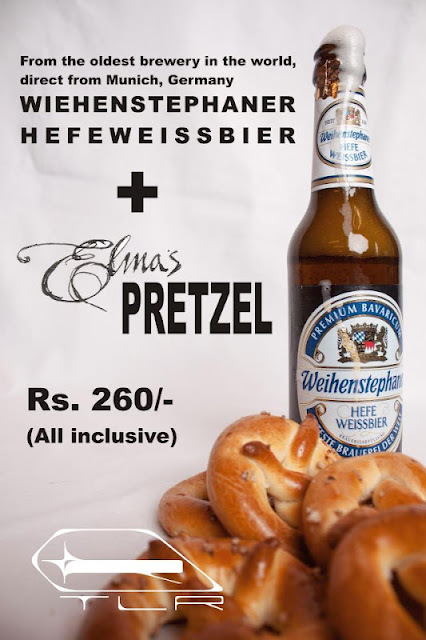 Get your Weihenstephaner and Pretzel's from Elma's for just Rs.260 !! A steal if I ever saw one - and for those that haven't tried this wheat beer, it is delicious! Rs. 500-600 for 5o0ml - inclusive of taxes! T.L.R. - ELMA’S Oktoberfest Desserts shall be available at T.L.R. for the duration of Oktoberfest. The Lalit - Plaza Terrace Garden - 28th, 29th and 30th September - 2 pm to 10 pm- German beer and traditional German Food that includes sausages, meatballs, and more. To add to the madness beer games - (Scroll below for more info on this ). Rs 1500 is the cover charge for 1 day and is fully redeemable. 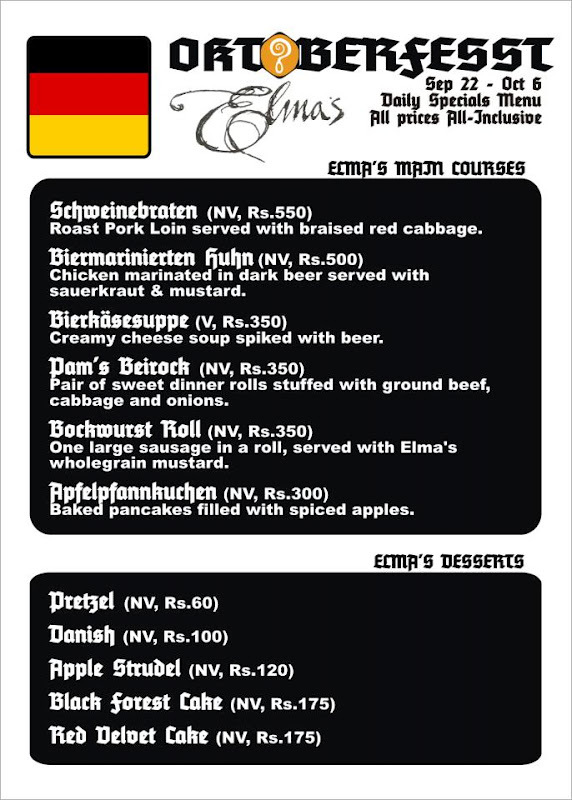 Elma's - Their Oktober Fest menu has got me drooling - From 22nd September to the 6th of October enjoy some serious deliciousness like Pork Loin w/ Braised Red Cabbage, Creamy Cheese Soup Spiked with Beer, Baked Pancakes filled w/ Spiced Apples and more! 2 2 Tango - For sausage heaven!! From September 22nd through October 7th - They are serving Bockwurst Sausages, Thuringian Rostbratwurst Sausages (Bratwurst), Munich White Sausages, Nurnberg Rostbratwurst Grill Sausages (my favourite), Black Forest Ham besides the traditional side dishes. Paired with more Weihenstephaners! GREY GARDEN - OKTOBERFEST SUNSET APERITIVO - WED 26/09 6PM and Wed 03/10 - Guest chef Morgan Daniel presents Oktoberfest Sunset Aperitivo on The Green Roof at The Grey Garden. Having spent his formation years contributing towards London's fine dining scene (The Ritz, Maze, Sketch, Gordon Ramsey). Free spirited chef extrodinaire - Morgan Daniel recently relocated to Berlin to expand his field of culinary expression. He is currently participating in The Grey Garden's chef residency program for 3 months of research, development, collaboration and cultural immersion. On these two special nights, he’ll be presenting Oktoberfest classics in microcosmic canape forms. 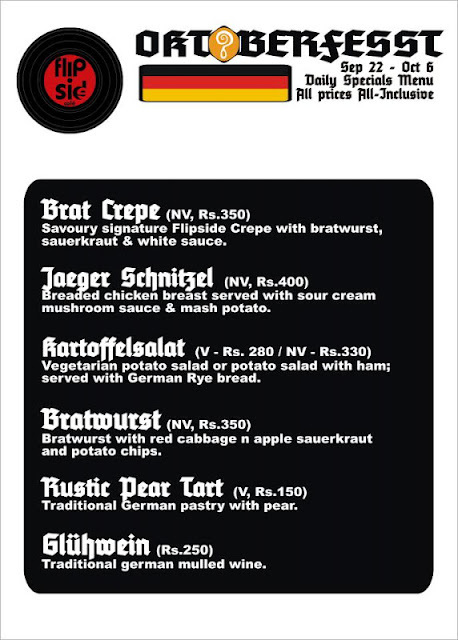 Flipside Cafe - The most twisted cafe indeed - where else will you find - Jaeger Schnitzels, Brat Crepes? That rustic pear tart sounds delicious too especially once you wash it down with some mulled wine! Iron Curtain will curate a programme of films for the duration of the festival including classic selections from German cinema as well as films inspired by beer and comradery, two essential ingredients of Oktoberfest. Seating is complimentary with purchase of food or drink. DAS BOOT BEER DRINKING TOURNAMENT - SAT 06/10 9PM T.L.R. Oral Storytelling is an ancient tradition that Germans have excelled at for centuries. From viking legends of conquest and adventure to medieval fairytales featuring forest creatures collected by the likes of the Brothers Grimm, German stories have spread far and wide. They've influenced many with leanings toward the macabre and mysterious, and never short of mischief. We’ve collected a few such twisted characters from New Delhi’s literary community for an unfogettable night of storytelling, skits & shotgun quizzing at Flipside, Hauz Khas Village’s most twisted café. Lodi Restaurant - Have got a range of Pauliners and Weihenstephaners especially for Oktober Fest. Their dates are from 1st of October to the 7th of October. A few different menu items too for that week like Smoked Salmon w/ Sour Cream, Potato Salad, Pork Loin and a bunch of other stuff that didnt sound all that Oktoberfesty but hey.. Unlimited beer (Miller and Foster's) and live grill with buffet German Bratwurst salads and desserts - Even though I do think it would be sacrilegious to be drinking Miller or Foster during a week of great beer! Waiting on a few other venues to get their act together as they still have no clue what they are doing! But will keep updating this if something worthwhile comes along..